Is there a bunny so sheltered that he or she has not seen myriad repetitions of denial starting with CO2 is plant food? Eli is a patient bunny, but has decided to take up arms against this nonsense. Go forth and spread the word. It annoys the hell out of those in denial about how people are changing the climate for the worse. Even better it is accurate. The bleats you will earn are your blessings. Yes, Eli has been on sabbatical, but he really has been thinking of the bunnies, especially with Easter coming up. Well, sometimes it just gets hard to think of something new and interesting and life, or at least Twitter, has become a series of re-runs where all that is needed is a link to some old Rabett Run post (there are some goodies there the Bunny will tell you:). In any case there has been recent discussion about a chart posted by the Lawrence Livermore Lab folk about US Energy consumption and copied to Twitter. Several are trying to use this as an argument against fossil fuels pointing to the fact that rejected energy is a large part of electricity generation and more.
. . . in effect, that it was pointless to try to solve global warming by building solar cells, because they are black and absorb all the solar energy that hits them, but convert only some 12% to electricity while radiating the rest as heat, warming the planet. Now, maybe you were dazzled by Mr Myhrvold’s brilliance, but don’t we try to teach our students to think for themselves? Let’s go through the arithmetic step by step and see how it comes out. It’s not hard. Interested or, as in the case of Eli, those with the dread forgetting disease, can follow Ray through the calculation, but the point is that all energy eventually (may take the age of the universe, but eventually) degrades to heat, but some of it can be used in the meantime to do work (move things non-randomly, including electrons). The reason that fossil fuels are heating the Earth is not that they produce heat as well as work, but that their CO2 emissions continue to increase the amount of thermal energy in the atmosphere, on the surface and in the oceans, over centuries. Sunlight heats the Earth and is degraded to heat which radiates into space by IR emissions from the surface and the atmosphere. Increasing the amount of greenhouse gases in the atmosphere slows the rate of radiation so that the Earth has to warm, increasing the rate of radiation to return the system to balance. Energy added on the surface by fossil fuel combustion or nuclear energy or wind or solar, or whatever is soon degraded to thermal energy and radiated to space. It's a small one time charge. The ratio between the work, W that can be done and the energy input U, W/U is the efficiency, and the heat produced is Q.
Thermodynamics sets the upper limit to efficiency. Engineering sets the actual limit. It turns out that renewables like wind and solar are not very efficient, but that the heat that they generate in creating work does not lead to a continual warming of the system over centuries. The same is true for heat generated in fossil fuel combustion, but, as RayP pointed out a decade ago, that is irrelevant, because the CO2 produced in fossil fuel combustion DOES heat the Earth for centuries. 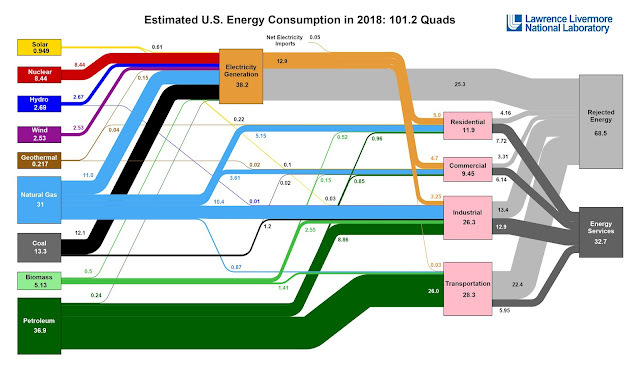 Turns out that California Energy Commission has gasoline data, lots of gasoline data. I downloaded and edited the data above. I've argued since 2013 that as EVs start taking up significant market share, the gas station and repair infrastructure for internal combustion engines will start to shrink and become less convenient. A similar-but-distinguishable process will happen with increasing ICE mileage, but that process stabilizes because even high mileage ICE vehicles still need gas and will pay enough to stabilize the number of stations. As EVs eat into the ICE infrastructure, the ICE market just gets less convenient and the shift to EVs accelerates in a virtuous feedback. The effect will be especially strong when people consciously notice the ICE infrastructure is getting less convenient, but that's not required. And I fully admit the more important factor, for now, is EVs becoming more convenient. Still, a choice of EV versus ICE turns in part on the relative convenience of the choice, and increasing inconvenience for ICE will have an increasing effect. Oslo would be the best place to test this, but I can't find their data. San Francisco Bay Area isn't a bad alternative. This doesn't constitute proof yet - 2016 was the highest year in the dataset, and it would be bold to claim the 2017 decline is from EV share of the fleet mileage traveled, but let's watch this space. Sabine Hossenfelder's new book, Lost in Math: How Beauty Leads Physics Astray is stirring up quite a stir with multiple reviews. Hossenfelder has recently stuck her oar into the question about whether a new supercollider should be built as a follow-on to CERN. The just-look-argument is of course well and fine. But, as I have pointed out many times before, the same just-look-argument can be made for any other new experiment in the foundations of physics. It therefore does not explain why a larger particle collider in particular is a good investment. Indeed, the opposite is the case: There are less costly experiments for which we have good reasons, such as measuring more precisely the properties of dark matter or probing the weak field regime of quantum gravity. Think of it as the argument btw theory: Go here and experiment: Cast about. When there is no indicative theory you cast about. You are making an economic argument not a scientific one. but the issue of beauty in physics, in science in general, what is worth doing, at least to Eli is of interest. About a month ago the Rabett in a comment to Hossenfelder thought that beauty in physics was a matter of being terse, spare simple. She really did not like that, and after all, who is Eli. Reading the New Yorker this week a rather better description appeared in James Marcus' memorial to his father, a bioscientist, who died a difficult death. Later, after his death, one of his colleagues noted that my father "believed that beauty would save the world". My father would never have said that about himself. Yet it was true, if you understood beauty to encompass not only ecstasy but precision, rigor a relish for the tiniest (literally microscopic) details. And it was true about me, too. We were a religious sect consisting of two people, and now half the congregation was gone. There would be no closure, no healing. I would simply adjust myself to a new and severely depleted reality. The world would come to an end, as it always does, one world at a time. ....This whole sordid mess is a product of, among other things, the insidious idea that it’s undesirable for people to have “dual loyalties” in the context of their relationships to nation-states. This idea is obviously absurd if stated as a straightforward proposition, which is why it almost never is. The accusation of dual loyalty, in other words, is based on a completely bogus theory of both human psychology and political morality. And yes, I realize “dual loyalty” is a classic anti-Semitic trope, but that accusation only has bite because of a perverted concept of patriotism, which requires loyalty to the present government of the nation of which one is a citizen to always trump every other consideration. In other words, “dual loyalty” is only bad per se if one accepts the essentially fascist concept of loyalty to a single nation state as the first duty of every citizen of the State. Read the whole, etc. While I think he has good points, esp about fetishization of the state, the acknowledgment that we have biases doesn't remove the obligation to confront and control those biases, to the extent we can and acknowledging our limits. The issue runs both ways - anti-Semitism has woken from near death with the rise of conservative nationalism, while the left has an obvious point at how biased American foreign policy is toward Israeli right-wing government positions and against Palestinians. My great-grandparents and their parents emigrated from Austria-Hungary to the US in 1910. My understanding is that German-Americans disproportionately opposed American entry into World War I. It's lost to time whether my relatives took part in those politics, but the German-American bias is worth acknowledging. It's not necessarily wrong - maybe we'd have fewer wars if people cared about the lives of family relatives in the opposing military trench. It does however complicate things. I hope we can get a somewhat-more balanced perspective on Israel (given everything global, I favor a somewhat pro-Israel stance for the US) while confronting anti-Semitism and other biases wherever they arise. So I liked the hype, but after five or six attempts, I'm just not sold on the Impossible Burger. Maybe I need to try it well done, but every patty I've had ends up a thin gooey red mess in the center. I'm guessing it might be okay as a crumbled addition to a entree, like in omelettes or tacos, but not as a burger. I've blogged before about Beyond Burger as a vegetarian alternative, and I think it's better. No clue why it sits in the grocery stores while Impossible Burgers command a premium at restaurants. Well, one clue - my wife can't stand coconuts, and it has a mild coconut smell and taste.. Anyway, not a burger substitute but far better than any vegetarian dogs I've had is Beyond Sausage, now showing up in my Safeway store. No coconut smell or taste btw. It wasn't so great on an electric grill, but sliced and fried up on a stove, it easily matches regular sausage. Convenience marches on. Contra David Roberts, I think to the extent environmentally aware people can easily do something more, we should do so.